Rancho San Lucas will feature an all-suite Grand Solmar Resort, luxury oceanfront real estate, a Greg Norman-designed golf course, and Mexican-inspired pedestrian village featuring shopping and dining options for the whole family. A dramatic setting, amidst the Pacific Ocean and Baja’s emblematic desert backdrop, will be home to Rancho San Lucas– a private resort community that will take ocean-front living in Los Cabos to the next level with stellar amenities that include a Greg Norman-designed golf course, state-of-the-art tennis center, an all-suite resort, and dining and shopping options within a Mexican-inspired pedestrian village. This 834-acre master-planned community, featuring 12 miles of expansive white sand beachfront complemented by dramatic succulent forest, will have the only true ocean-front home sites in the area, offering real estate investment opportunities at The Villas and The Estates– all showcasing a unique combination of Spanish and Mexican architectural elements and emphasizing the balance between luxury and the beauty of the natural surroundings. The most exclusive address is The Estates with 32 single level estate homes and 36 luxury condos. The Villas are located on the highest vantage point of the development and afford spectacular ocean, golf and desert views. “We are excited to see this wonderful land come to life as the embodiment of Baja’s legacy– a place where five decades ago the pioneering spirit of a man saw promise for greatness. We envision a one-of-a-kind development devoted to conserving the true nature of its environment and are committed to creating a unique, quality product deeply rooted in the love for the land and the Baja way of life,” said Claudia Velo, Director of Marketing for Rancho San Lucas. Rancho San Lucas broke ground in January of this year with the beginning of construction of the Grand Solmar at Rancho San Lucas and already shows signs of momentum with cleared roads, vegetation rescue for future landscaping and Greg Norman’s second visit to the site. The first phase of the development is slated to debut winter 2017 with the luxury resort, Grand Solmar at Rancho San Lucas. 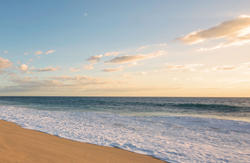 With equally convenient access to trendy downtown Cabo San Lucas and the delightful Mexican ‘magic town’ of Todos Santos within a 30-minute drive, Rancho San Lucas promises an unmatched ‘best of all worlds’ lifestyle. Rancho San Lucas is located on the Pacific Coast, 20-minutes from downtown Cabo San Lucas. An 834-acre master-plan that will complete phase one by winter 2017 with the opening of the Grand Solmar at Rancho San Lucas and the Rancho San Lucas Golf Club with its Greg Norman golf course. Rancho San Lucas is currently offering real estate investment opportunities at The Villas and The Estates with single-family residences, oceanfront estate homes and condominiums. For more information about Rancho San Lucas, visit http://www.ranchosanlucas.com, follow us on Twitter @RanchoSanLucas, Instagram and visit our Facebook page. Established in 1973 Solmar Group includes a collection of five all-suite resorts offering guests the highest quality of service and hospitality and the master-planned private resort community of Rancho San Lucas. Within the past year, two of the group’s properties; Playa Grande Resort and Spa as well as the Solmar Resort and Beach Club were awarded the RCI Gold Grown Resort Award. Additionally, TripAdvisor recognized Grand Solmar Land’s End Resort & Spa among TripAdvisor’s Traveler’s Choice Awards. The property was ranked 8th among the Top 25 Hotels in Mexico and received TripAdvisor’s Certificate of Excellence. For more information about Solmar Group, visit http://www.solmar.com.